Lumina News file photo. 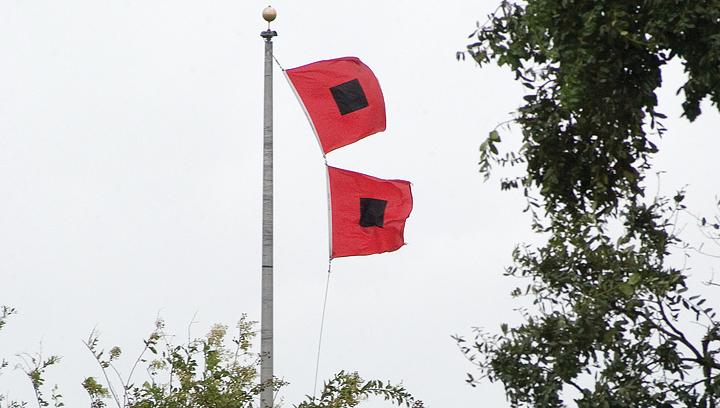 Warning flags fly in front of town hall in Wrightsville Beach as Hurricane Irene passes offshore Aug. 27, 2011. Hurricane forecasters with the National Weather Service predict anywhere between 10 and 16 storms for the Atlantic coast this year, according to a briefing presented earlier this month. Of those storms, forecaster predict 5 to 9 may reach hurricane strength, and 1 to 4 of those may be considered a major storm. “We are looking at a 75 percent chance of near or above normal activity this year,” said Steven Pfaff, Warning Coordination Meteorologist for the National Weather Service in Wilmington. The National Hurricane Center will extend the length of hurricane-force wind forecasts by 12 additional hours, now out to 48 hours. “We’ll be able to produce site-specific forecasts at an earlier time than we could have,” Mark Bacon, the severe weather program manager, explained. Storm Surge Watches and Warnings will move from experimental to operational this year and Surf Zone forecast will continue during tropical storms. An El Nino effect is anticipated by forecasters later in 2018, which typically has an adverse effect on tropical cyclone activity in the Atlantic due to sinking air, strong wind shear, and warmer water temperatures. The pattern for the Atlantic coast has been roughly 30 years of warm water followed by roughly 30 years of cold water from 1880 to 2000 due to climate change. Subsequently, El Nino and La Nina have been balancing out hurricanes across the Atlantic coast. Hurricane season typically begins on July 1st annually for the Atlantic coast, lasting through the end of November. Although, there was an early start this year with the formation of Subtropical Storm Alberto the last weekend of May. So far this season there have been two other named storms reported. Tropical Storm Chris skated past the Carolina coast some 200 miles offshore before strengthening to a Category 2 hurricane and moving northeast across the gulf stream. Dealing with a tropical event is a yearly occurrence in this part of the country, Armstrong said, noting that since the 1950’s there have been 88 tropical cyclones recorded in the forecast area of the Cape Fear region. Twenty-six of those storms moved through the area as hurricanes.